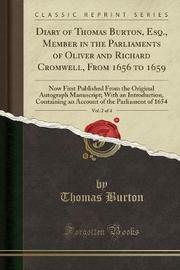 Excerpt from Diary of Thomas Burton, Esq., Member in the Parliaments of Oliver and Richard Cromwell, From 1656 to 1659, Vol. 2 of 4: Now First Published From the Original Autograph Manuscript; With an Introduction, Containing an Account of the Parliament of 1654 Lord Whitlock. Appoint a Committee to peruse the book, (it is tending to highest sedition and rebellion, ) that it may be burned, as in cases of the like nature has been, and the persons may be tried by law. Sir William Strickland and Lord Strickland. It is a very wicked and seditious book, and deserves to be burned. I desire a Committee be appointed to examine it, and that the persons be transferred to the Upper Bench for their trials. About the Publisher Forgotten Books publishes hundreds of thousands of rare and classic books. Find more at www.forgottenbooks.com This book is a reproduction of an important historical work. Forgotten Books uses state-of-the-art technology to digitally reconstruct the work, preserving the original format whilst repairing imperfections present in the aged copy. In rare cases, an imperfection in the original, such as a blemish or missing page, may be replicated in our edition. We do, however, repair the vast majority of imperfections successfully; any imperfections that remain are intentionally left to preserve the state of such historical works.